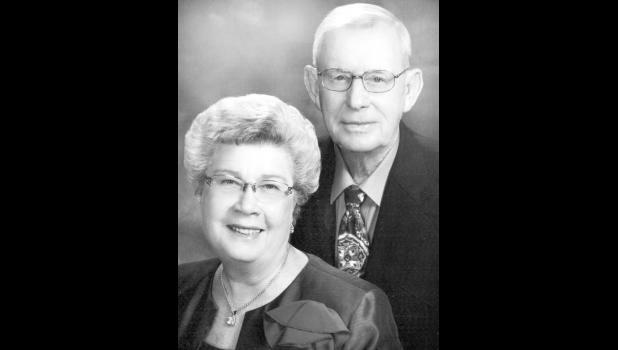 William and Phyllis Zibell of Holton will celebrate their 60th wedding anniversary with a reception from 1 p.m. to 3 p.m. on Saturday, Oct. 15, at Penny’s in Holton. The event is being hosted by their children and grandchildren. Phyllis Tudor and William Zibell were married Oct. 12, 1956, at First Presbyterian Church in Holton by the Rev. Archie Ross. They have two children, Gary Zibell and his wife, Becky, of Holton and Carrie Hildenbrand and her husband, Greg, of Lawrence. The couple also has four grandchildren, Kylie Boyd and her husband, Chris, of Garden City, Kurt Zibell and his fiancée, Shelby Erickson, of Holton, Grace Hildenbrand of Topeka and Reid Hildenbrand of Kansas City. The couple also has one great-granddaughter, Madyn Boyd. Friends and relatives are invited to attend the celebration. The couple requests no gifts. Cards may be sent to 10847 Kansas Highway 16, Holton, KS 66436.